Very interesting article. It is amazing what music can do for someone. I have heard of the elderly listening to music they used to listen to as a young person and it just opens their minds and hearts. It is such a therapeutic, wonderful thing to see children “come alive” with music. Music “clicks” with them and they become emotionally happy. Thank you for writing this piece to open all our eyes in a masterful way of helping our special needs children. Music definitely brightens our day and lifts up the mood of everyone, young and old alike. It is more beneficial for our special kids because even if they are non-verbal, their faces and reaction will tell everyone how they feel. They can express themselves through music and improve their focus and communication skills. Musical experiences in children can actually accelerate brain development, particularly in the areas of language acquisition and reading skills. Most children recognize music faster than learning to speak. Teenagers match musical experiences to form friendships and to set themselves apart from parents and younger kids. They often want to hang out and listen to music after school with a group of friends. I listen to music to calm my heart too. I definitely agree with you, music enhances the kids’ speaking and academic skills. They learn how to focus and express themselves. That’s why I encourage parents of special kids to enroll them in a music therapy program. I also believe music becomes an important part of a teenager’s life. It helps them to connect with their peers and lets them express how they feel, especially to their crushes. Every generation has different choices of music, that’s for sure. I believe music is therapeutic for not your child with special needs but for everyone. Including the musicians that create it. I’m a musician and it’s very therapeutic to write music and play music as well. I can definitely see how this could be therapeutic for children. Have you ever tried the focus music playlists on Spotify or YouTube? I couldn’t agree more; music is really therapeutic both to the musician, like you and the listener. This is especially true for children with special needs, they really learn how to focus, engage and develop their communication and social skills, as well as their fine and gross motor skills. Thanks to composers and musicians like you, our days become happier and more relaxing because of your awesome music. I usually play relaxing music ( from You tube ) at work to help me focus. I’d like to start by saying how sorry I am for your loss. The fact that you’ve taken such a tragic event and turned it into a platform to help others is amazing and inspiring. I agree with you that music can be so therapeutic for children with special needs, I think it can be therapeutic for all. Music can change our moods with a single melody. I really enjoyed your article and how detailed you got in order to help others. Thanks for your concern of my loss. My family decided to make my sister’s passing away more meaningful by helping other children with special needs. She did not have the chance to attend any special education program, and I know that it really impacts the kids’ development so we fully support them in our town. It’s our way of honoring my beloved sister. Yes, music is for everyone. For children with special needs, it adds more meaning and so beneficial for them. This was very inspiring to read. How you talk about your sister, I know she must have been a very special person to you and to all people around her. For me music is very important in my life. I can’t imaging life without my music, as I love to listen (really listen) to the instruments and the lyrics. It helps me relax after a long busy day. I just put my headphones on and relax into the music. Yes, my sister Pangga is very special to me and my family and everyone who comes in contact with her. She was a happy person who exudes love and innocence. Music is for everyone. Our world becomes a happy place with music. It connects every person, regardless of age, color, or culture. I’m happy to know that you love music. It also makes my day light and relaxing. I usually hum a tune anywhere and anytime. Glad that my article inspired you. As a former Geriatric Nurse I had the opportunity to work with special needs adults, including down syndrome and I certainly can agree that Music is healing. I don’t know much about children with special needs but I can say that music therapy also can apply to adults as well. I remember one elderly man who was in a deep dementia stage and barely interacted with anyone only sitting on his favorite chair day in and out. We, the stuff, tried many things with him to get him out off his inner shell. Nothing seems to help. We had a music therapist coming to another patient and I could see the positive impact each time she was with this patient. I asked her if she would like to play to this man where we had tried so many things to get him out off his “closed in” stage. She agreed and to make a long story short over a few times she came to volunteer, her musical approach made a difference. This patient opened it’s eyes every time she started playing her instrument, a flute. She also played the violin and we discovered this was the alternate instrument which got this man really open up. Later talking to a relative of his we discovered that this man’s late wife did play the violin. This story of mine also had a long term effect that music became a constant part as a form of therapy. Your article really brought this experience of mine back to life. I’m glad to know that you had a positive experience with music therapy for adults with dementia. It’s the same with special kids , they also open up, engage, focus and enhance their communication skills, as well as their fine and gross motor skills. Hey there! Thanks so much for this information! I was just talking to a friend who’s child is having communication problems. I hadn’t thought about it but it makes sense that music can help. I will definitely be forwarding your site because so that she might be able to use music to help her son. Your friend’s child will surely benefit from music therapy. Does he have other concerns or special needs? He might need to be assessed as well by a Developmental Pediatrician, if not yet been seen. Thanks for planning to refer your friend to my site. I hope my posts will be helpful to her. I think music can be therapeutic for anyone, especially children with special needs. I like how you break it down by saying exactly what music therapy is and how it benefits and improves children with special needs. I now know what to look for in a music therapist as I certainly believe that they need to have patience and endurance, loves being around children, is passionate, and even play a musical instrument all of which you mentioned. Where is the best place online to search for a music therapist in your area? Music can be therapeutic for everyone. Personally, I enjoy humming a tune all the time. it relaxes me and uplifts me. I’m sure anyone who does that feels the same as well. I would just search in google for any suggestion on where to find a music therapist if I need one. Maybe asking friends would be a good option as well, especially friends whom you know play any musical instrument or love singing. Music is also great therapy for everyone, it can brighten the day in the most positive way. Our family has a member who is unwell and that member of our family is greatly uplifted by the sound of music each day. Thank you for this very inspiring article and i would definitely say, YES, music is therapeutic. Music is for everyone. It is a universal thing that anyone benefits from. Our children with special needs really thrive well with a musical therapist as well. Sorry about your family member who is unwell. Glad to know that music is therapeutic for him. Since I come from a family of musicians, went to a music highschool and used to play the Violin and the Piano for a long period of time, I know how music can affect a human’s brain activities. Not just humans, even animals are affected by music. And playing an instrument has been scientifically proven to have a positive impact on the human brain as well as ones emotions. Especially special needs children can benefit from music and its therapeutic effects. Music means love and passion and I absolutely believe in the fact that these kids develop much better. Great article! Wow, your household must always be in a joyful mood with a family of musicians. Even for yourself, I assume when you are stressed you just play the piano or the violin and voila, your mood changes positively. Likewise, special needs children do appreciate and learn that music enhances and enlightens their minds, thus they become more focused and attentive. Thanks for the informative and useful post! Since Pangga never learned how to read but only memorized the songs’ lyrics just by listening to the radio, watching the television, or hearing other people sing, it means she was good at emulating others or learning by emulation. How I wish she could stay back to continue leveraging her special music talent! Literally, music is therapeutic and can help kids with special needs overcome their inadequacies. Kudos to you for stating the characteristics of a good music therapist! Particularly, I’ve personally observed that a good music therapist will always love to sing and play musical instruments. Pangga will always be our angel and her singing will always be etched in our hearts. I can certainly see her wide smile everyday as if she still sings with us and laughs for no reason at all. Though she passed away and left us, her memory and angelic voice will always bring us joy and calmness in any circumstance. A good musical therapist definitely has to love music, know how to sing, and play a musical instrument so he can deliver his job well and touch his clients, as well teach them how to focus and be more expressive. Music has huge benefits for all of us and especially children with special needs and people with dementia. Also playing musical instruments is fun and great for mental stimulation. Also listening to music is good for relaxing, when you are stressed out. It was great that music brought so much joy to Pangga. Thank you for talking about a really important topic. This topic is really close to my heart because music was a great part of Pangga’s everyday life. We would often be amused when she starts singing. I guess it is therapeutic not only to her but to us as well. We feel the joy and the calmness that it brings to our house whenever we hear her sing. Playing any musical instrument is of course fun and relaxes our tired minds. It also transports us to a world of something magical. Great stuff here. One of my best friends is special and is one of the brightest people I know. I am constantly amazed by how his mind works. When he could learn at his own pace and ask questions he would absorb the info like a sponge. It was just so hard for him to keep up with groups of people because their minds would constantly received and think about 100 different things at once. Thanks for sharing about your special friend’s love of music. It is truly therapeutic for him. He learns to focus and think clearly when he listens to the songs. Special people think much different than us and it’s so comforting to know that music stabilizes their thinking. Glad you realized that you know better your friend now through how he is affected by music. What I know about working with children and adults with special needs is second hand. My daughter is a drama therapist and director of a center that provides daytime activities for people with special needs. From her conversations regarding her work, first of all we can see how much she loves it. She shares about how the drama therapy they provide is therapeutic and helpful in keeping people involved and focused on something outside of themselves. She explained that music always plays a big part in what they do. There had been some excitement in the room between a counselor an a special needs person. Each guest or student in was asked to stand on their feet and sing along with a song they had learned. Singing that song calmed the room down and put everyone back in a better mood. If we are honest with ourselves, we know that music makes us happy and changes our moods. I hope those with special needs can do the same. Great post to shine light on the needs of this special group. Glad to know that your daughter as a drama therapist enjoys her job. By doing so, she is able to attain easily the goals of her therapy to her clients, in which music is definitely part of it. Of course music brings joy to everyone and improves our mood, even for children with special needs. Music is definitely, therapeutic for kids with special needs as it is for anyone. The videos on your post show that when the music is played to them they want to join in and play. I can see that repeated playing will increase their interest. Playing music is like playing a video game and a special needs child could play an instrument if encouraged and with some helpful coaching (accredited musical therapist). I also play harmonica which is easily learned, but perfecting it and playing at the level you want takes time and practice. There is no way we could live without music. Thank you for making us aware of the power of musical therapy for the special needs. We all enjoy music, moreso for children with special needs, they not only enjoy listening to it but learn to focus as well and enhance their communication skills. Life without music would be boring and sad. I love this article, music is truly a powerful tool in many aspects and I have always known that there are many beneficial effects when it comes to music. Some people use music to stimulate their creativity, and it doesn’t surprise me one bit that it has many benefits for special needs children. Is there a particular age when something like this should be started? Truly music improves focus and enhances communication skills of kids with special needs. For everyone, it sparks creativity and helps relieve stress and anxiety. I believe as early as you can, music will be helpful. I read somewhere that music therapists are actually hired to help sick babies in the ICU. Your post really resonated with me, because I believe music is the key to almost everything good in life. The fact that kids who can’t even read the words, like your sister, is really a wonderful thing. Music for me, has always helped me get through the tough times. With your post, it will really open doors for people that have children with special needs. Music is the key to your soul, I say. I think that your post will really give people an outlet for their child, that they may never even thought of before. Thanks Coralie for the appreciation. Definitely, music uplifts everyone’s soul, moreso with our special kids. This article truly touches my heart and soul. Music is a powerful tool that helps many of us in everyday life. It’s amazing how therapeutic for special need kids. I love reading your story about how Pangga loved playing the harmonica. After reading this article I hope people really take this and learn what a difference music can bring joy and happiness in the lives of special need children across the world. The harmonica has a very special role in our family because it was Pangga’s favorite musical instrument. Playing it really brightened up her day, ours as well. I really hope my post will inspire the parents of our special needs kids to enroll their kids to music therapy classes. There is just so much impact music has on human life and existence, right from the time of creation till date. From experience I have seen people get healed through the effect of music. I am of the opinion that music works with the human brain, soul and spirit, and when the soul unites with the spirit there is harmony which brings all round healing. Music is absolutely therapeutic and the healing effects cannot be overemphasized. 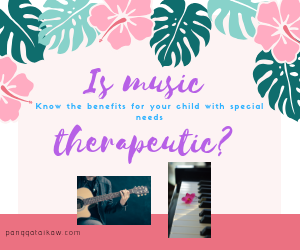 Children with special needs must be provided with music therapist to help bring out the best in them, create a happy mood and happy environment for them to learn and improve in themselves. Especially, they should be provided with musical instrument of their choice to play with.as this will help to uplift their emotions, their spirit and it will give them joy. Very well said! Truly music brings out the best in all of us, including our special kids.